Scrip is “substitute money” in the form of gift cards to hundreds of retailers. 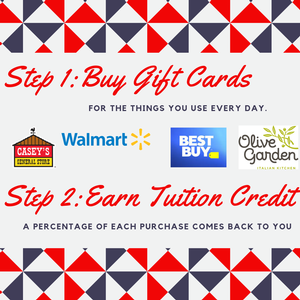 You pruchase gift cards from the school in advance of your shopping, and then pay for your purchases with the gift cards, just as you would with cash. You can use Scrip gift cards for everyday expenses like food, gas, clothing and other essentials. With every purchase, you earn tuition credit AND support the school. Questions? Email scrip@incaonline.org. This is easy and convenient way to earn tuition credit and support the school!